Size is 22"x 28" including a 1.5" white border. The Martin P5M Marlin was the follow-on aircraft to the Martin PBM Mariner and was the last operational flying boat used by the U.S Navy. Primarily designed to hunt down and destroy the USSR's huge cold war submarine threat, it was equipped with the latest electronic gear available in the 1950s. Marlins saw combat service in the Vietnam War mainly as a patrol aircraft. 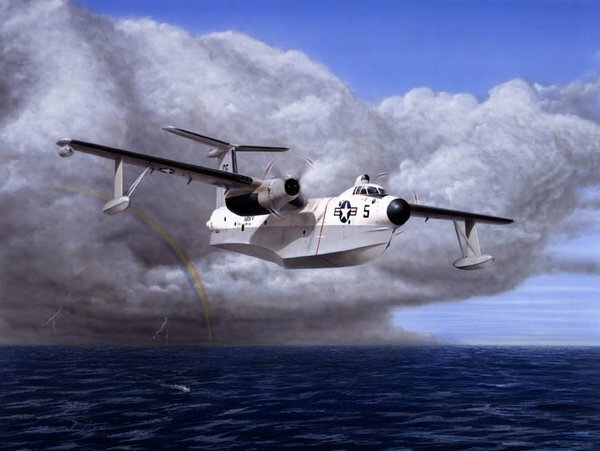 The Marlin was also used by the U.S. Coast Guard and the last of the P5Ms, known as SP-5B by then, were retired and flew their last missions in May of 1967. A total of one hundred twenty-one P5M-1s were built with another one hundred seventeen more P5M-2s built on what turned out to be Martin's last aircraft production line. The Martin P5M Marlin was the follow-on aircraft to the Martin PBM Mariner and was the last operational flying boat used by the U.S Navy. Primarily designed to hunt down and destroy the USSR's huge cold war submarine threat, it was equipped with the latest electronic gear available in the 1950s. Marlins saw combat service in the Vietnam War mainly as a patrol aircraft. The Marlin was also used by the U.S. Coast Guard and the last of the P5Ms, known as SP-5B by then, were retired and flew their last missions in May of 1967. A total of one hundred twenty-one P5M-1s were built with another one hundred seventeen more P5M-2s built on what turned out to be Martin's last aircraft production line.The Martin P5M Marlin was the follow-on aircraft to the Martin PBM Mariner and was the last operational flying boat used by the U.S Navy. Primarily designed to hunt down and destroy the USSR's huge cold war submarine threat, it was equipped with the latest electronic gear available in the 1950s. Marlins saw combat service in the Vietnam War mainly as a patrol aircraft. The Marlin was also used by the U.S. Coast Guard and the last of the P5Ms, known as SP-5B by then, were retired and flew their last missions in May of 1967. A total of one hundred twenty-one P5M-1s were built with another one hundred seventeen more P5M-2s built on what turned out to be Martin's last aircraft production line.